There’s a tiny coffee counter in a corner of the Salvation Point depot where, my wife says, they make the best skinny vanilla latte west of the Rockies, though I wouldn’t know, I never touch the stuff. I can’t tell the difference between “good coffee” and “crap.” It’s all crap to me but 50 million Elvis fan’s can’t be wrong. Anyway, sitting on the platform at the depot this morning, sipping our drinks (mine’s a hot chocolate with caramel – room for whipped cream? Oh yes!) we overheard some drama brewing in small-town coffee. His name’s Daniel (NOT Dan – Daniel) and he just signed on with National Roast as a junior regional rep. Today he’s shadowing Joe (yup), who’s been schlepping beans throughout the Four Corners for thirty-three years. A good mentor to a kid new to the coffee game? Joe is two cups – black – from the Oster drip maker with the newspaper in the morning. Daniel is a half-caf-soy-macchiatto-165-degrees-no-whip while his free hand skates across his tablet on the train. Daniel doesn’t see Joe as having much of a shadow and he plans to grow out of it swiftly. Joe’s comfortable book of business is mostly sleepy lunch counters with three kinds of pie and one kind of customer: hardworking southwest folks with enormous bellies over enormous belt buckles. The proprietors count on Joe for caf and decaf, and to make sure it’s good, abundant, and the coffeemaker’s working. To ease the new kid into the routine, Joe has planned visits today to his gentlest accounts. “Something we should really be doing,” Daniel says authoritatively. Daniel (NOT Dan – Daniel) nods patronizingly. “Steamed-milk base,” Joe repeats slowly, ignoring the glowing graphs on the tablet. He imagines visiting Clark Vasallis at the Stop Here up on 191, where truckers can get chicken-fried steak, a shower, replacement taillights and black coffee twenty-four seven. He imagines discussing Daniel’s study over Clark’s cluttered desk, imagines Clark repeating “steamed-milk base,” then imagines ducking as Clark hurls a Peterbilt mug at Daniel (NOT Dan)’s forehead. 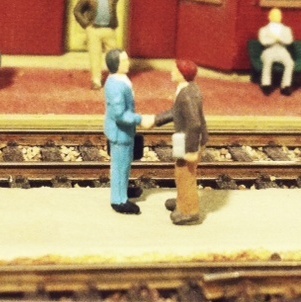 This entry was posted in ModelStories and tagged coffee, fiction, Model Railroading, sales. Bookmark the permalink. IT’S NICE HAVING STORIES TO GO ALONG WITH A SCENE! Thanks again for reading and sharing, Jonathan. Cheers. ORT-ORT (AND THAT’S MY STORY! )!